I saw it for $150 up here. $120 seems like a bargain. Hopefully, they’ll have it at the Philly Extravaganza in a couple weeks. Sounds delicious. 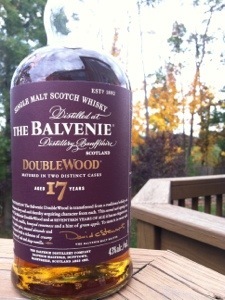 The question is… Is it 2.5X better than the 12 YO DoubleWood? I think it’s a case where you have to be appreciative of the depth the extra maturation give you. If that isn’t something that concerns you it probably would not seem to be worth the extra. I’m definitely curious to try it since I too am a fan of the 12 year old DoubleWood (I’m not that hung up on price when we’re talking about something special. We’re grown ups. No one is forcing us to buy expensive whisky). Rumor has it that there’s a sample coming my way. And I’m pretty sure one of us has a standard issue DoubleWood around, so perhaps a side by side is warranted. It’s really a nice and helpful piece of info. I am happy that you simply shared this helpful information with us. Please keep us up to date like this. Thank you for sharing.